Few things I have been working on for your gaming pleasure! Still have work to do for the full RT mod but this was a nice change of pace and theater. It's the early stages but I have been itching to get moving on all the other titles. 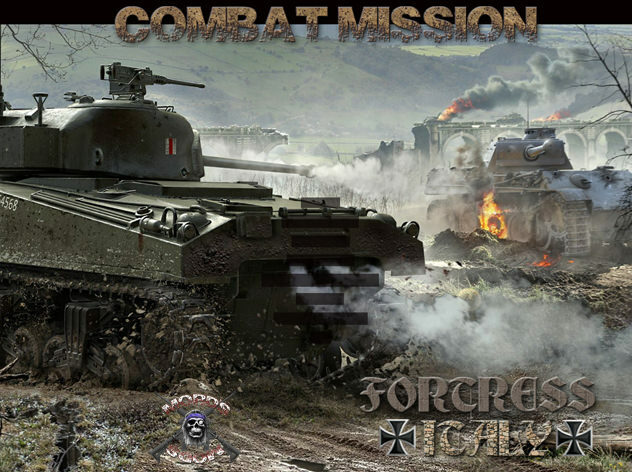 Only on thing that looks a little off to me is the helmet eagles - on the fallschirmjagers in particular. The helmet flash/badges etc. are there for added flavor and flair, they are not meant to be an accurate display of location/size etc. You'll see this if you have used my old BN/FI mods. For instance, I use SS runes without the shield on some Waffen SS units, or have CW flash off to the side of a helmet. I am working in a 51x57 pixel window so artistic liberties are taken in the place of realism when needed. In other words the eagle is there to represent that this guy is in the Luftwaffe and differentiate him from say a Heer soldier but not to historically represent where the eagle should be, it's size, coloring, etc. just a little detail for spice. To put it into perspective, within the 51x57 pixels I am trying to convey a combination of the unit type, its military branch, the season/location, the country, the division, and in some cases the division plus its battalion/regiment structure. The average non-hires helmet texture in CM is 512x512 pixels, and a uniform is 1024x1024, so I am trying to squeeze all that info into a space 10 to 20 times smaller than that which a single helmet (10x smaller) or uniform (20x smaller) uses. Overblown explanation? All that for an LW eagle? LOL. Maybe. But I wanted to take this opportunity to explain a bit of the intricacies of the design, why I make the decisions I do and just how little space there is to do it all in. This is micro modding in the extreme. The only thing more extreme would be the work of guy's like @JuJu who have tackled even smaller stuff in the UI. These are exceptional! I especially like the British portrait in the upper left. Looking forward to seeing US units! Thanks, man. Yeah, I can't wait to get to them as well. I just happened to get lucky and cracked the CW tanker enigma that has been perplexing me for months and ended up going on a binge. You would not believe how many individual pieces make up just one of their portraits. I think for the NZ guy it was seven! It's gonna be a real PIA when I get to the infantry. I can only imagine all the little pieces that come together to create these. I've started to save all photoshop templates along with the finished BMP files to keep track of everything, and to have as a reference if I need to go back to it to tweak something, or for a future creation. I've also taken to making quick notes in a word document on how to do certain things in photoshop. I'm very much an amateur and basically figure things out as I go. It's never fun to forget a newfound technique only to need it a few days later! One thing I think we learned from Mord earlier. Store all that somewhere in the cloud just so you never lose it. I can only imagine all the little pieces that come together to create these. I've started to save all photoshop templates along with the finished BMP files to keep track of everything, and to have as a reference if I need to go back to it to tweak something, or for a future creation. I've probably said this many times before but if I had one piece of advice for anyone that just started modding, THAT would be my number one, most important. Nothing hurts more than starting from scratch after you forgot to save a template! I can't count how many hundreds of hours that cost me way back when. LOL. Now I have a couple hundred pngs and PSD files. Anything from a single beret, to a Luftwaffe helmet eagle, to a headless body, to all the crap you see in one of my portraits (soldier/background/helmet flash/shield) in a multi-layered file. I've also taken to making quick notes in a word document on how to do certain things in photoshop. LOL. Good idea, it's definitely a perishable skill. I've had to brush up on a few things this year when making my splash screen for RT because of forgetting how I did something. Thankfully Youtube rescued me. Speaking of notes you should see all my yellow note pads on divisions and stuff, they look like a drunk had a seizure all over them. I finally started creating Word documents to keep better track and make them neater. More lessons learned, eh? I'm very much an amateur and basically figure things out as I go. It's never fun to forget a newfound technique only to need it a few days later! If you can figure out the right question to ask, search Youtube some time when you are having difficulties you may pick up some tips that will speed things up. The hard part is figuring out how to express the problem you are having so the search engine will lead you to the right spot. Yeah, back up your stuff! I have multiple copies of on my HD alone. And rank insignia icons measuring 33x28 - This an 1.lt from the communist army of DRA. Thanks, glad you appreciated my long winded post. I was hoping it didn't come off as defensive as it's hard to infer tone when typing. Now THAT is micro modding! CM's weapon slots are 99x46. The really small stuff I think occurs when you get into special equipment and ranks. Did you do work with Dreaded 88? I dabbled in playing with the Vietnam mod way back in like 99 or 98 and I remember his name being associated with maps, I think? I was never a big fan of CC but I tinkered with it because there wasn't much else going at the time besides SP. Looks superb, Mord. Very much looking forward to them! The faces are almost photographic, or maybe very realistic art paintings. My favorite is the middle right (CW?) guy. @Erwin, that would be Canada. Yeah, I like him a lot too. 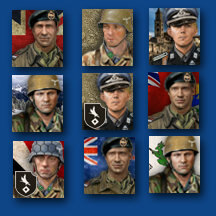 I was very, very, very happy with how the tank crews came out. It was a break through that was a long time coming. I've been messing with these guys off and on since before I announced the RT mod. 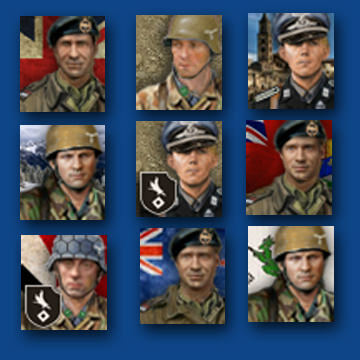 Managed to get the British armoured infantry designed along with a special guy. Worked on these dude for ten hours today. LOL. I am beat. They look fantastic to me! The detail specific to the Gurkha's is a very nice touch. 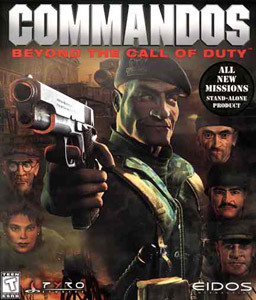 The British guys with the berets remind me of the old game series "Commando's" which I assure you is a good thing. Very nostalgic. Glad you like them. 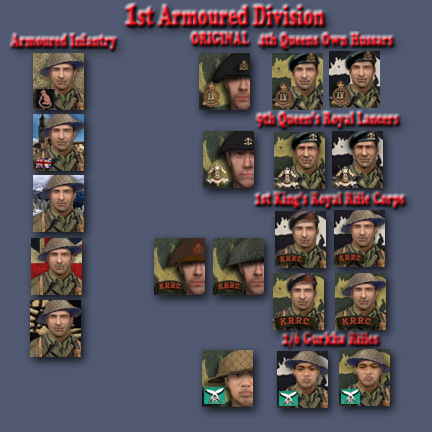 The Queens Own Hussars and 1st KRRC is armoured Infantry and that particular formation (KRRC) wore a brown beret (I may need to lighten it a bit it's hard to tell unless it is side by side with a black beret portrait). I added the helmet version in case people prefer that. 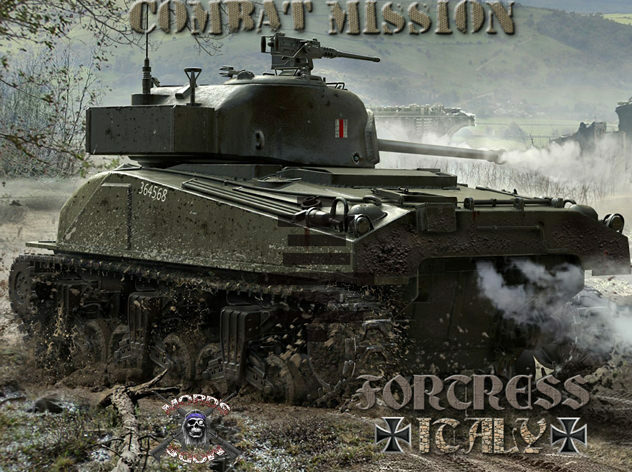 From what I remember from DC and his notes, I believe these guys operated AFVs and always wore the brown beret, and were not traditional CM armoured infantry. I'll have to double check the notes, I may have them confused with the QOH. I had a helluva a lot of fun designing that Gurkha, btw. Love the gurkha as well! New menu mod for FI up at CMMODS. Any news about your amazing mod ? Hey, Thomas. I haven't done any work on it recently because I'd switched gears to work on CMSF2 portraits. But I do have more done than when this thread was last updated. I am a bit burned out right now so I haven't been modding at all lately. I needed a break. 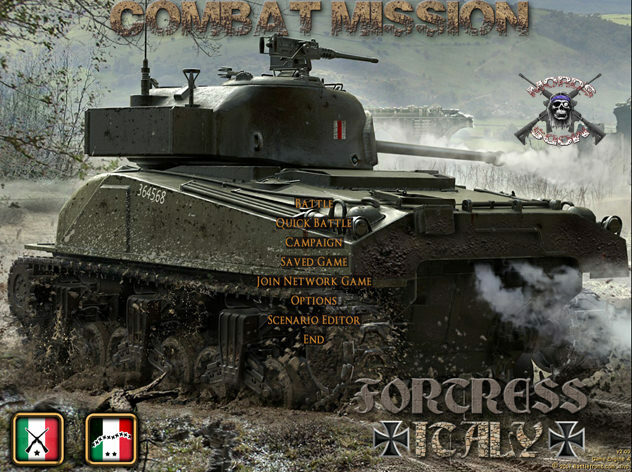 Just got Battle Brothers and all the FoG II DLC for my birthday so I am gonna be doing some non-CM gaming for a bit. Hopefully I will have it done before the module comes out. Don't worry though, I will finish it. I am not one of those guys that abandons my mods once I announce them because I don't want to disappoint people. I just need to recharge my creativity and relax for a while. Maybe go chop wood or dig holes for a week or two? Hope enthusiasm returns. It's fun to do but it can get mentally exhausting after a while, especially when the art isn't working out the way you want it to. I'll be good after some time away (it's always like this). I got some cool games at Christmas (thanks MJ!) and for my B-day (belated) so I am excited to have some new genres/styles to play. They are a nice change of pace. I have a few games now that are right up there with CM on my love-o-meter. Field of Glory II is the biggest surprise so far, though it shouldn't have been considering I like Pike & Shot and Sengoku Jidai. That whole rules system is like a more relaxing version of Total War. I have completely fallen for it. 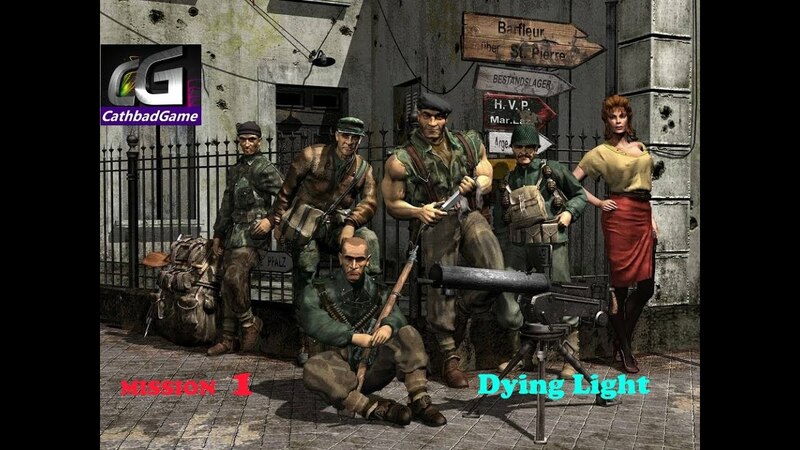 They could make DLC for the next ten years and I'd get every bit. And HOLY CRAP, my brother got me Battle Brothers on Steam and it is just KILLER! I LOVE the art style and the game play is really deep. So, I'll be chopping but it'll be heads instead of wood!